Internet is full of free online tools and web-based applications which make some long-term processes easy and fast. These web-applications are alternatives to their desktop applications which prevent us from downloading and installing the software on our computer. Using these tools, you will be able to do your work within your browser, most of these are free to use and most are even don’t requires any registration process that we’re sharing with you through our blog here at Tech Web World. If we talk about free online conversion tools, up till now, we shared few awesome internet freebies for example, online tools for converting youtube videos, Online Video Conversion tools pdf to excel conversion tools etc. As well as other online tools i.e Free online virus scanners Making free online phone calls and many other, And we’ve to continue that sharing because these tools help our readers and are very useful and interesting for our readers We have some quite interesting tools that are now waiting to be discussed in our upcoming posts. Anyway, here in this post we’re going to share some tools that allow you to convert a pdf file format to a Microsoft word file format that is .doc or .docx. Well, sometimes you get a pdf file but it need to be in word file format, for instance, you want to make some editing In pdf file or there may be any other reason for you, so in that case you should need to convert that file to word .doc format. These tools we’re going to share will done the work for you. So let have a look! pdftoword Is one of the best, free and popular online tools that convert a pdf file to Microsoft word file format within the browser. You can also use this free web-app in order to convert your pdf files to word file online. I think a very little child can also use this one because it don’t need any effort, what you’ve to do is to upload a pdf file from your computer by clicking on the choose file button and then click on convert to word button. Once you clicked that button, a short process of converting starts and you get the file converted in word file format. PDFConverter.com’s free online PDF converter allows users to convert a PDF of any size into an editable Word Document. Unlike many similar converters, this tool can even convert a scanned PDF. It supports OCR (optical character recognition) technology, which is needed to extract data from a scanned PDF. The conversion process is over in three easy steps. Once completed, the download link for your Word file will be sent to your email address. In addition to that, PDF converter has its desktop version that I use personally and I am happy with it. You can download PDF Converter here and take advantage of its 7-day free trial. I will suggest you this one to you if you are looking for a tool that do a very fast conversion for you. This website loads very fast and also gives you the converted file very fast after you uploaded. To convert you files using this tool, you’ve to click on choose file to upload a pdf file and then click on convert button. After that, you it will start their process of conversion and start downloading the converted file automatically. 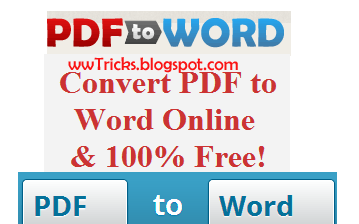 This tool is also a good one for converting pdf files to word online for free. Using this tool you will be able to convert a pdf file to word (.Doc), Text, or only images. In addition, you can download the file in a zip by clicking on the appropriate radio button. Yes you also use this one to make a conversion of pdf to word online. You have to follow these two steps i.e drag or upload a file and then enter your email address and finally to click on convert it button. You can make use of pdf online to convert a pdf file to word file format within your browser. It don’t require any application, extension etc to make a conversion. What you have to do is to upload a file by clicking on "Upload a file to convert" button. After selecting a file this will ask you whether if you don't want to make your file file public, so sletect one which you want and click on continue button to start the conversion. The tool in question is a very smooth PDF to HTML converter that can be helpful to bloggers who wish to upload some PDF content on their website. The converter does it automatically, so there is no need to have any HTML coding knowledge. So friends above we shared the list of best and free online tools that converts pdf files to Microsoft file format, I hope the post was useful for you and will help you at the time when you need to convert a pdf file to word file format. If the post help you then please share this post with your friends. Comments are appreciated related to this post. If you know about any other tool that you think is best and not listed above then share it with us in your comment. I have tried with cyrillic this web site http://go4convert.com/ToWord and it worked for me. Give a try, may be it also can useful for you. For the surprise it was quite quick. Yeah. Its also a great one! It is a quicker one also, thanks for sharing it with us. You have also got a very useful and fast one. I would like to recommend this one to my friends & readers. Try pdf2doc.com. It allows bulk conversions and has no silly file size limits like many others. Hmm. Thanks for commenting and mentioning a nice tool, I just checked it and I impressed! I will try to add it to my list and will suggest to my readers to use it.